Look What We Found During Your Auto Service! Welcome to Joe Davis AutoSport, your first choice for import and European auto repair in Perkasie, PA. We specialize in maintaining premium, luxury makes such as Audi, BMW, Mercedes Benz, as well as Toyota, Honda, and Subaru for customers looking for the very highest levels of diagnostic capability, technical expertise, and client service. Rest assured, when you visit our state-of-the-art Perkasie auto repair facility, you and your vehicle will receive the meticulous attention to detail that import cars – and their owners – demand. From factory scheduled maintenance to comprehensive system repair, our ASE Certified technicians are trained and experienced in providing the full array of maintenance and repairs that import vehicles require to drive safely and at optimum performance. At Joe Davis AutoSport, we know import cars – and we know their drivers. It’s part of our commitment – and our passion – to ensure that our cars’ and our drivers’ needs are met quickly, efficiently, and with the highest levels of care and expertise. At Joe Davis Autosport, we’re serious about Asian and European auto repair. 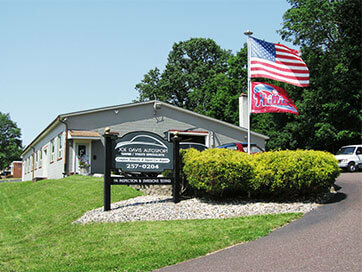 Perkasie drivers know us as a trusted alternative to pricey dealerships! With a passionate commitment to client satisfaction and an unmatched level of technical expertise, our locally owned, family operated business is poised to be the one stop shop for all of your Perkasie auto repair needs. While we specialize in beautifully engineered, highly technical European makes like Mercedes, Audi, BMW, and Volvo, our expert technicians are happy to answer the challenges of all import makes and models. No matter the make or model you drive, we invite you to call us, schedule service online, or contact us today!